The ICT sector is crucial as a driver of economic and social growth. Not only is it an important industry in its own right, but it also provides the communication and infrastructure without which modern economies could not function. How does this sector work? Why is it stronger in some countries than in others? What should companies, governments and regulators be doing to enhance its contribution? 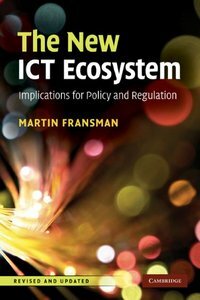 In The New ICT Ecosystem, Martin Fransman answers these and other questions by developing the idea of the ICT sector as an evolving ecosystem. He shows that some components of the ICT ecosystem, particularly the innovation process, work better in some countries and regions than in others. For example, the Internet content and applications layer of the ecosystem tends to work better in the US than in Europe or Asia. The analysis in this book enables policy makers and regulators to understand why some parts of the ICT ecosystem are underperforming and what can be done to enhance their performance. The bibliography of this book has several mistakes: The title "Wikinomics" is missing, the from von Hippel is called "The SourceS of Innovation".